Aspartame, the artificial sweetener, is made of two amino acids bound together by a molecule of methanol. The white powder is sweeter than sugar, and its purpose is to give you the sweet without the calories. A great idea, but is it really? There are many indications that aspartame is not as healthy an alternative to sugar as its creators and vendors would have us believe. The isolated amino acids excite neural activity leading to effects on the brain and the methanol binder degrades into a nasty poison in the bodies of consumers. Research to prove those effects however is hard to come by. After all, the manufacturer has no reason to provide evidence that would end a winning streak of profitability. Dr. Morando Soffritti at the Italian Ramazzini Foundation fed aspartame to mice and rats and found it had a multi-potential carcinogenic effect. An Icelandic university researcher found that the consumption of those artificially sweetened soft drinks was associated with premature termination of pregnancy in a study of Danish women. Numerous "anecdotal" reports of effects on the brain and the nerves have been compiled, but they are of course not scientific enough to catch the attention of the health authorities. The FDA has stopped accepting complaints and reports of aspartame related side effects soon after it became clear that they would have to take action if complaints continued to pile up. The international committees in charge of evaluating additives have "reviewed the evidence", meaning the studies that were sanitized and provided to them by the manufacturers, and they cannot find anything wrong. And so we are left with a sweetener that is sold all over the world, consumed by hundreds of millions of people. Its effects are devastating to many, but there seems to be no way to make the health authorities pay heed. Hundreds of complaints of those suffering aspartame's effects have come to the attention of two members of the European Parliament, Corinne Lepage and Antonyia Parvanova. They organized a seminar to try and force action on the part of the European Commission and the agencies responsible for health and consumer protection. Two members of the European Parliament organized a seminar on the possible dangers of Aspartame, the controversal artificial sweetener manufactured first by Searle and now by the Japanese Ajinomoto. Aspartame is present in thousands of products, including a few hundred medicines, particularly meds for children. Studies have shown it to be associated with cancer and other deleterious health effects. 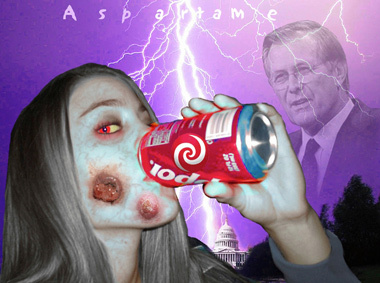 Aspartame consumers have told horror stories of its effects. Yet, our health authorities show no will to warn consumers or even to pro-actively look into aspartame's effects. Corinne Lepage expressed her shock "by the failure to examine the subject more thoroughly, and the close links that have been established between industry, the EFSA and the Commission, each one passing the buck to the others. This attitude has meant that looking at the health effects of aspartame is no longer taken seriously." For Antonyia Parvanova, "Aspartame is a substance to which millions of consumers are exposed on a daily basis. For this reason, and even if there is only a hint of risk, the European health authorities should commit themselves proactively to the gathering of data and the supervision of complementary and independent studies, instead of being passive and waiting for additional data to come to them". In a more recent development, the European Parliament's Environment Committee is now pushing for a warning label on aspartame. The European Parliament's Environment committee is pushing for a warning label on products containing aspartame stating that they may not be suitable for pregnant women - despite opinions from EFSA and the French food safety ANSES that scientific evidence does not warrant a reconsideration of the sweetener's safety. Video: Artificial sweeteners: Should we be afraid of Aspartame ? This is a long video (one hour and 55 minutes) and it is the complete record of a seminar organized by ALDE, the Alliance of Liberals and Democrats for Europe, at the European Parliament on 16 March 2011. The first speaker is Dr Morando Soffritti of the Ramazzini Research Foundation in Bologna, Italy, who presents experiments conducted at the institute that showed aspartame to be associated with increased incidence of certain cancers in laboratory animals. Thorhallur Halldorsson of the University of Iceland relates of a study that found a 30 to 80 % increase in pre-term delivery in pregnant women in Denmark who consumed artificially sweetened soft drinks. Hugues Kenigswald of the Unit supporting the scientific panel on Food Additives and Nutrient Sources added to Foods - ANS, of the European Food Safety Authority, explained how aspartame has been evaluated by the EFSA and its predecessor, the Scientific Committee for Foods (SCF), stating that "further studies are needed". In the second part of the discussions the question is: Should the precautionary principle be applied to aspartame use as an additive. The tone is set by A.G. Renwick a scientist working for the International Sweeteners Association who points to an "enormous and comprehensive safety database on aspartame", and assures participants that aspartame is one of the best evaluated and most studied substances. He adds that the new studies - both of the Ramazzini Institute and the Iceland University researchers - do not give any reason to be preoccupied. Lynn Insall of the CIAA (Food and Drink Industry Association) also calls aspartame the "most studied food additive" used at safe levels, and she adds that aspartame allows the drink industry to provide for consumer choice. Laurent Chevallier from France talks about risk/benefit analysis saying aspartame is not effective in weight loss, and since there are a lot of warning signs, EFSA should very well review and challenge the early studies that were used to set the acceptable daily intake for aspartame. He criticizes EFSA's handling of the controversal sweetener. Katrien Renders of a Dutch consumer group does not add much to the specific discussion of Aspartame. She makes it clear however that there are strong feelings on the consumer side about the safety of additives. Concluding speaker is Michael Flueh, Head of the Chemicals, contaminants and pesticides unit of the European Commission's Health and Consumers Directory (SANCO). He states aspartame has been re-evaluated various times, and that the Commission will continue to monitor the scientific literature. He denies that there is a need to intervene at the present time. This page contains a single entry by Sepp published on April 21, 2011 11:20 AM. Radiation exposure chart admits cancer radiotherapy delivers fatal dose to patients was the previous entry in this blog. Don't Go Near the Water is the next entry in this blog.